Deeper and darker…what a ride! I just love this whole series so far, and what a reminder! To do this book justice and remind myself of the story so far, I went back and read the first two books, Age of of Myth and Age of Swords before leaping into this latest tome. 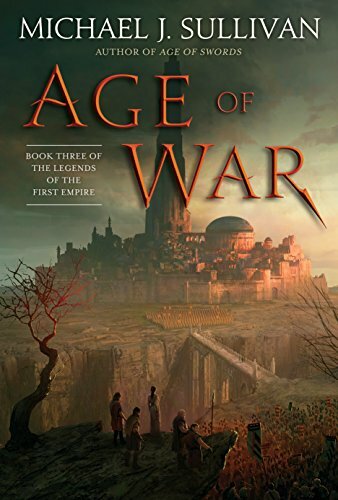 It was an engrossing binge-fest to add Age of War to the mix as the storyline became deeper and darker and even more fascinating. I’m not entirely sure I can separate the stories from between the three books now, since reading them so quickly back to back, but happily, Age of War plunges right back into the midst of the story with one of my favorite characters, Suri, as she waits for Arion to awaken, and she and Michael J. Sullivan hit the ground running and never let up. Sullivan pulls off what is one of my favorite styles of writing, where the story just keeps getting twistier and mystery stacks upon mystery as the story unfolds to be a much larger mythology than it felt like at the beginning of the tale. Sullivan’s writing improves with each book, as does his plotting. While there are a few too-telegraphed reveals, that’s a minor quibble when so many strands of the tapestry are coming together on so many story levels in such a satisfying way. While there are many important characters, each is fleshed out well, except where the needs of the mystery intervene, and the world-building is comprehensive, immersive, and believable. There are many strong female characters in this book: Suri is an incredibly powerful Rhune mystic, Roan is a Asperger-y inventor, Moya is a fierce warrior, Persephone is a chieftain’s wife who’s united the Rhune tribes beneath her as keenig, Arion is a Fhrey/elf mystic and Suri’s mentor who has changed sides and now defends the Rhune against the Fhrey, Brin is the keenig’s Keeper of Ways who’s reinvented writing, and Padera is a grouchy old Rhune healer who has hidden motivation for her treatment of a young crippled character. Well, I could go on, plus add in the male characters, but I’ll only mention a few. Raithe continues with honor in this book, while Nyphron provides even more mystery, and a certain someone who shows up in a garden in other places is revealed to be even more mysterious. I’m also questioning if a certain Fhrey lady is who she seems to be. Overall, an excellent read, I’d say incredibly fun, except this book is so dark at times it left me alternately spent and crying at those spots. And yet, through the bleak darkness, there was always a reason to continue, a reason to have hope. In the end, I was left very pleased with how the story was fleshing out and yet also just so ready to plunge into the next book. Can’t wait to read it! Carry on, Mr. Sullivan; we’re waiting! Highly recommended. The epic battle between humankind and their godlike rulers finally ignites in the masterful follow-up to Age of Myth and Age of Swords. The alliance of humans and renegade Fhrey is fragile—and about to be tested as never before. Persephone keeps the human clans from turning on one another through her iron will and a compassionate heart. The arrogant Fhrey are barely held in check by their leader, Nyphron, who seeks to advance his own nefarious agenda through a loveless marriage that will result in the betrayal of the person Persephone loves most: Raithe, the God Killer. As the Fhrey overlords marshal their army and sorcerers to crush the rebellion, old loyalties will be challenged while fresh conspiracies will threaten to undo all that Persephone has accomplished. In the darkest hour, when hope is all but lost, new heroes will rise . . . but at what terrible cost?